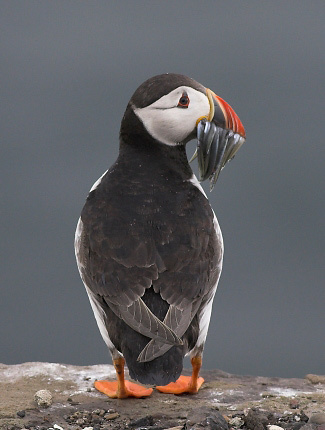 There are plenty of Puffins nesting on Newfoundland. This superb photo was taken by Tom Tams. Whales and more seabirds, including Great and Manx Shearwaters, and Leach’s and Wilson’s Storm Petrels, may be seen from the ferry between Argentia on Newfoundland and North Sydney on Nova Scotia, although the schedule allows for only a few hours of daylight. Across Nova Scotia lies the Bay of Fundy in Eastern Canada where large numbers of Northern Right and Fin Whales, and seabirds, including Great Shearwaters and Wilson's Storm Petrels, gather, mainly in August and September, with peak numbers and activity usually during the first half of August, the same time the incredible numbers of migrating Semipalmated Sandpipers usually peak. The bay area is also famous for other migrating birds, notably warblers, especially during the first half of September. Newfoundland is well-known to American birders as the best place to see vagrant species from Europe, including annual visitors such as European Golden Plover, Yellow-legged Gull, Northern Wheatear and Redwing, and rarer birds like Grey Heron, Little Egret, Common Redshank, Common Greenshank and Fieldfare. The birds listed are usually present during the northern summer. (Atlantic) Puffin, (Northern) Gannet, Brunnich’s Guillemot (Thick-billed Murre), Black Guillemot, Common Guillemot (Common Murre), Razorbill, (Black-legged) Kittiwake, Bald Eagle, Blue Jay and Cedar Waxwing, as well as Common Eider, Great Northern Diver (Common Loon), (Northern) Fulmar, Double-crested and Great Cormorants, Osprey, Killdeer, Greater and Lesser Yellowlegs, Least Sandpiper, Great Black-backed Gull, Arctic and Caspian Terns, Belted Kingfisher, Black-backed Woodpecker, Northern Flicker, Yellow-bellied Flycatcher, Philadelphia Vireo, Grey Jay, Shore (Horned) Lark, Black-capped and Boreal Chickadees, Red-breasted Nuthatch, Hermit and Swainson’s Thrushes, American Robin, warblers including Black-and-white, Black-throated Green, Blackpoll, Magnolia, Mourning, Tennessee and Wilson’s, and American Redstart, American Tree, Fox, Song, Swamp, White-crowned and White-throated Sparrows, Dark-eyed Junco, Common Grackle, Pine Grosbeak, Two-barred (White-winged) Crossbill and American Goldfinch. Also a chance of (Rock) Ptarmigan, Red Grouse (Willow Ptarmigan), Ruffed and Spruce Grouse, Manx and Sooty Shearwaters, Pomarine Skua (Jaeger), Short-eared Owl, Northern Saw-whet Owl, Tengmalm's (Boreal) Owl, Grey-cheeked Thrush and Evening Grosbeak. Humpback and Minke Whales (both Jun-Sep, mostly late June to early August) and Snowshoe Hare. Also a chance of Fin Whale, (Atlantic) White-sided Dolphin, Moose (introduced), Caribou, Black Bear, Beaver, Arctic Hare, Harbour Porpoise, and Common and Grey Seals, and an outside chance of Canadian Lynx. Witless Bay Humpback Whale and up to two million seabirds including Puffin (250,000 pairs), Brunnich’s and Black Guillemots, Common Guillemot (about 400,000 pairs on Great Island alone) and Razorbill. Also a chance of Fulmar and Gannet. (Also present but unlikely to be seen are an estimated 600,000 pairs of Leach's Storm Petrels). Bidgood Park sparrows such as Fox and Swamp, as well as Cedar Waxwing, and Blackpoll and Wilson’s Warblers. La Manche Provincial Park Yellow-bellied Flycatcher, Brown Creeper, Pine Grosbeak, and Blackpoll, Black-throated Green and Magnolia Warblers. Sub-arctic barrens of the southeast Avalon Peninsula Willow Ptarmigan, Horned Lark, Boreal Chickadee, Yellow-bellied Flycatcher and Grey Jay. St Vincent's Beach One of the best places to watch Humpback Whales from shore, with whales sometimes very close inshore if their main prey the Capelin are running. Road to Cape Pine American Pipit, Horned Lark and Caribou. Cape St Mary's A gannetry with thousands of Gannets, several thousand pairs of Common and about 2000 pairs of Brunnich's Guillemots (the most southerly in the world), some Razorbills and Black Guillemots, Kittiwake, American Pipit and Horned Lark. Also a chance of Humpback Whale offshore. Terra Nova NP Warblers including Black-and-white and Black-throated Green. Also a chance of Spruce Grouse and Tengmalm's Owl, as well as Black Bear and Beaver. Gros Morne NP Least Sandpiper, Black-backed Woodpecker, Grey Jay, Boreal Chickadee and warblers including Tennessee. Also a chance of Rock Ptarmigan (Long Range Mountains), Northern Saw-whet Owl, Grey-cheeked Thrush, American Tree and White-crowned Sparrows, Evening Grosbeak, Woodland Caribou and Arctic Hare. Arches NP An outside chance of Canadian Lynx. Humpback Whales usually arrive along the south coast during the late spring (June), following Capelin which gradually move north, along with the whales, along the east coast of Newfoundland, usually arriving in Witless Bay during July and remaining farther north along the east coast until September. Peak numbers of whales are normally present from late June to early August, but seabird numbers usually begin to fall by late July so the first two weeks of July are probably the peak time to visit Newfoundland. Mammals of North America by R W Kays and D E Wilson. PUP, 2009 (Second Edition). Mammals of North America by F A Reid. Peterson North American Field Guides, 2006 (Fourth Edition). Peterson Field Guide to Finding Mammals in North America by V Dinets. Houghton Mifflin, 2015. Field Guide to the Birds of North America edited by J Dunn and J Alderfer. NGS, 2011 (Sixth Edition). Kaufman Field Guide to Birds of North America by K Kaufman. Houghton Mifflin, 2005. The North American Bird Guide by D Sibley. Helm, 2014 (Second Edition). The Crossley ID Guide: Eastern Birds by R Crossley. PUP, 2011. Peterson Field Guide to Birds of Eastern and Central North America by R T Peterson. Houghton Mifflin, 2010 (Sixth Edition). Kaufman Field Guide to Butterflies of North America by J Brock and K Kaufman. Houghton Mifflin, 2003. National Geographic Birds: Field Guide to North America. The Sibley eGuide to the Birds of North America. Peterson Birds of North America. Audubon Birds - A Field Guide to North American Birds. iBird Ultimate Guide to Birds. Many trip reports, some for Newfoundland, are posted on the websites listed here. On some of these websites some reports are independent and some are posted by tour companies who organize tours to Newfoundland. These tour companies and others also post their own reports on their websites, which are listed under 'Some Organized Tours to Newfoundland' below. Tour companies who are running organized tours to Newfoundland in the next couple of years include the following. Many of these also offer custom tours.